(Nanowerk News) When Felix Fischer of the U.S. Department of Energy’s Lawrence Berkeley National Laboratory (Berkeley Lab) set out to develop nanostructures made of graphene using a new, controlled approach to chemical reactions, the first result was a surprise: spectacular images of individual carbon atoms and the bonds between them. 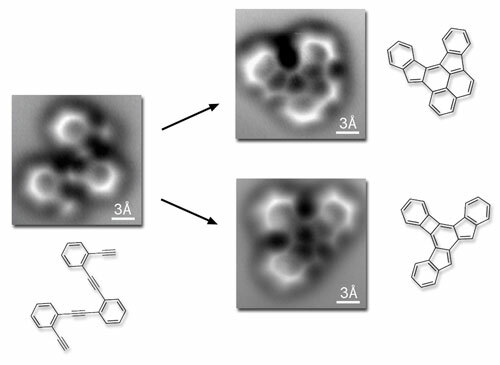 The researchers report their results online in the May 30, 2013 edition of Science Express ("Direct Imaging of Covalent Bond Structure in Single-Molecule Chemical Reactions"). Graphene nanostructures can form the transistors, logic gates, and other elements of exquisitely tiny electronic devices, but to become practical they will have to be mass produced with atomic precision. Hit-or-miss, top-down techniques, such as exfoliating graphite or unzipping carbon nanotubes, can’t do the job. Fischer’s group collaborated with microscopy expert Crommie to devise the best possible view. The first attempt to track the reactions used a scanning tunneling microscope (STM), which senses electronic states when brought within a few billionths of a meter (nanometers) of the surface of the sample. 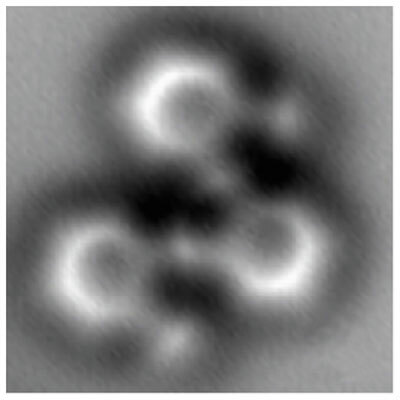 But the image resolution of the tiny molecule and its products – each only about one nanometer across – wasn’t good enough to reliably identify the molecular structures. The original reactant molecule, resting on a flat silver surface, is imaged both before and after the reaction, which occurs when the temperature exceeds 90 degrees Celsius. The two most common final products of the reaction are shown. The three-angstrom scale bars (an angstrom is a ten-billionth of a meter) indicate that both reactant and products are about a billionth of a meter across. A chemical bond is not as simple a concept as it may appear, however. From the dozens of possibilities, the starting molecule’s reaction did not yield what had intuitively seemed to Fischer and his colleagues the most likely products. Instead, the reaction produced two different molecules. The flat silver surface had rendered the reaction visible but also shaped it in unexpected ways.